What is the big controversy surrounding Psalm 83? Nathan Jones: Bill, before we get into your new book, Psalm 83: The Missing Prophecy Revealed, can you tell us a little bit about your background? How did you get into Bible prophecy? Tell us a little about your ministry. Bill Salus: I became a Christian in 1990 while attending a Chuck Missler Bible study on the book of Revelation. I remember thinking, "Oh my goodness, God really knows the end from the beginning. No one else can do that." As a matter of fact, Isaiah 46:9-10 became one of my favorite passages, and so I founded my ministry upon its teachings. "Remember the former things of old. I am God, there is no other. I am God. There is none like me, declaring the end from the beginning." God is a God of prophecy, and the only One. He authenticates His own word. That became how I open my radio show up by saying, "Welcome to Prophecy Update, where we intend to authenticate the sovereignty of God through Bible prophecy by telling you what Bible prophecy has to say about these last days." But, we don't leave it there. I get into the fact that in Revelation 19:10 the testimony of Jesus is the spirit of prophecy. Nathan Jones: You were saved by studying prophecy, and so therefore you decided to devote your life to teaching Bible prophecy? Bill Salus: I just became obsessed with it. When I get into something, I become a little obsessed, Nathan. Back when I had a mortgage business at one time, I would get up early and study for a few hours each day before I went to work. Then through time I took a lot of notes and people encouraged me to start turning those notes into chapters. The next thing you know, I'm issuing books and became an author and speaker. Nathan Jones: So, you do speak and go to speaking engagements? 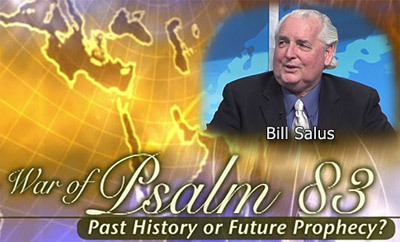 Bill Salus: Yes, I speak at conferences and churches and do a lot of TV and radio. I have my own radio show as well. Nathan Jones: Which I've been on, and it's a great show! Bill Salus: Yes, David and you as well have both been on the program. People can watch via my website at prophecydepot.com. It sounds like Home Depot, as I try to keep it simple. We have a newsletter that people can subscribe to there, and I try to respond to emails and comments. I'm a little slow on occasion, but please send me your comments. Then all of my teaching materials are available there as resources as well. I have lots of articles and all of my media shows and things like that posted to my website. Dr. Reagan: Most Bible prophecy experts seem to believe that the next major prophetic war in the Middle East is likely to be what the Bible calls the War of Gog & Magog which will feature a Russian led attack on Israel. But, Bill, you believe otherwise. You believe the next war prophesied in end time Bible prophecy is going to be the war described in Psalm 83. Bill, you burst onto the Bible prophecy scene in 2008 with a very insightful book called Isralestine. I endorsed it immediately because I felt it provided the missing link in end time Bible prophecy. However, others pounced on it, criticizing it heavily. Bill, you've now come out with a new follow up book called Psalm 83: The Missing Prophecy Revealed. In this book you respond to the criticisms of the thesis in your first book. Nathan Jones: So, Bill, what's it like to be in middle of a big controversy? Bill Salus: When I wrote the book, I expected this could happen because it was new ground in the study of Bible prophecy. I had to do about seven years of research to make sure that I covered all the bases. Second Peter 1:20 says that no prophecy is subjected to individual interpretation. So, when these opposing arguments came forward, I considered them very carefully and deliberated over them very prayerfully to make sure that I had the right thesis on Psalm 83. And so, my pencil is sharpened and I do really believe this is a prophecy for our time. Dr. Reagan: There is a verse about iron striking against iron, and controversy makes you sharper, right? Bill Salus: Absolutely! We look at prophecy these days as if we are looking through a glass dimly. But, we are the generation that experienced the prophecy about Israel becoming a nation again, and so we are the generation that has been given more exact details about the end times to line them up with Scriptures. I think we are so close to the Psalm 83 prophecy being fulfilled and some of the other prophecies that we can get some pretty good clues as to what is going to happen fairly soon. Through the Scriptures, we can watch the geopolitical events unfolding before us. I think we are about ready to see something break wide open in the Middle East. Nathan Jones: Before we get into those events, maybe you can give us a little summary of your new book. Tell us what the thesis is of your new book, Psalm 83: The Missing Prophecy Revealed. Bill Salus: Absolutely. Psalm 83 is an ancient prophecy written by Asaph 3,000 years ago at a time when Israel was experiencing unprecedented conditions from the blessings of the Abrahamic Covenant. They were a people in their own land. They were winning wars. They were talking about building their Temple. They had their anointed King David. And then, Asaph is given this prophecy from God that's nothing short of a genocidal attempt on the Chosen People and a confiscation of the Promise Land. It was a very specific prophecy about the ten populations that would confederate one day to come against Israel to destroy her. Asaph's prophecy has not found fulfillment yet. When we try to understand who these Psalm 83 enemies are today, we find out that they are Israel's enemies that share common borders with Israel, including the terrorist population inside of those Arab countries. It's a very timely prophecy, especially now that Israel is threatened by Hezbollah, Hamas, and the Muslim Brotherhood. Amazing when you think that this prophecy concerning a specific Arab confederation was written 3,000 years ago! Dr. Reagan: Basically, what you wrote about in your first book, Isralestine, is you said that Psalm 83 is more than just what most people think of as an imprecatory prayer. You believe instead that Psalm 83 is a prophecy concerning the end times which concerns a war that is going to take place between Israel and the immediately surrounding nations that have a common border to Israel — an inner ring — as you often refer to them. You also believe that Psalm 83 is talking about a different war from the War of Gog & Magog in Ezekiel 38 & 39, which is one that prophecies about an outer ring of Muslim nations that will attempt to destroy Israel. That is one of the reasons why I endorsed your book immediately, Bill. I always felt like that there would be a war between Israel and the inner ring, and that would ultimately lead to the War of Gog & Magog. I always believed that and I taught that and wrote about it, but I'd never tied it to Psalm 83. When you came and tied it to Psalm 83, the realization suddenly clicked and I said, "Yes, that's it! That's the reason why that inner circle is not mentioned in the War of Gog & Magog." When it's only an outer circle of nations prophesied about, you're left to wonder why not the nations next to Israel. According to Psalm 83, they've already been taken care of earlier by Israel. That's your basic thesis? Bill Salus: That is the thesis of the book, summarily. I do coin the term "inner circle" for those Arab countries that share a common borders with Israel and the terrorist populations within, and they are clearly not listed in Ezekiel 38 & 39. I then coin the term "outer ring" for that peripheral group that comes I believe in a subsequent prophecy upon an Israel that is dwelling securely, which at this point Israel is not dwelling securely. Dr. Reagan: I believe your theory completely answers the question of why is it that in the War of Gog & Magog none of those inner circle of nations surrounding Israel are mentioned. Ezekiel just lists the nations that do not have a common border with Israel. Why wouldn't the ones that have a common border be included in some kind of Islamic campaign to annihilate Israel? People who study Bible prophecy have to come up with the solution to that conundrum. Bill Salus: I think Israel's border nations were intentionally omitted because they are not involved in the War of Gog & Magog. It's not like Ezekiel, when he wrote Ezekiel 38, was not familiar with the populations of Psalm 83 — the Edomites, the Ammonites, the Moabites, etc. As a matter of fact, in one way or another, Ezekiel wrote about all ten populations found in Psalm 83 exactly 89 times in his 48 chapters found in the book of Ezekiel, but he did not include those border populations once in Ezekiel 38 & 39. We've got so many other differences between Ezekiel 38 and Psalm 83. There are different purposes between the battles. For instance, in Psalm 83, the border nations come together to form a crafty council, for they want to take the pastures of God for their own possession. In other words, they want one more Arab state, if this is to find fulfillment today. These Muslims want to call it Palestine. On the other hand, in Ezekiel 38 & 39, Russia is coming, not for the land, but after great plunder and great booty. There are also different defeats. We are told in Ezekiel 38:16-39:6 that it is the Lord, not the Israeli defense forces nor America, but the Lord clearly is stepping divinely in with fire and hailstones to destroy the enemy armies in the War of Gog & Magog. The Lord Himself stops the nations Ezekiel describes. But, in Psalm 83, we find that the Israeli Defense Forces are being called upon to defeat the Arab enemies around them. I'll point out here that the Israeli Defense Forces today exist in fulfillment of Bible prophecy. There are also different populations. Those Ezekiel 38 & 39 countries have to come through the inner circle lands to even get to Israel. Are all the nations circling Israel going to allow the Iranian and Turkish armies through? Not likely! Some people try to lump the border nations into Ezekiel 38:6 where it says there are "many peoples with thee." But, that is really quite a stretch. Ezekiel was very specific about Meshech and Tubal and everybody he listed, so you'd think he certainly would have thrown in by name the Philistines and the Edomites. Dr. Reagan: Another point you made in the original book is the timing of Psalm 83. You put it before Gog & Magog? Bill Salus: Yes, and I think that's pretty easy to understand why because of one of the descriptions we are given in Ezekiel 38:8-13. In those verses we find several very important things to identify, the chief being that Israel today even exists. Are they dwelling securely in the midst of the land, in the latter days upon the mountains of Israel, without walls, bars, nor gates? Does Israel now possess great plunder and booty, because that is the very thing that Russia covets and so forms a coalition of Islamic nations to come after it in Gog & Magog? David, you and I have had this discussion about Israel not dwelling securely at present, without walls, nor bars, nor gates. Dr. Reagan: True, for Israel is building a 450 mile wall right now. Bill Salus: Absolutely! So, Israel is not dwelling securely in their land. They have check points and security gates throughout Israel. And so, at this point in time, I don't see that Israel dwells securely. Contrary to what a lot of people think that the Hebrew word yashab betach meaning "dwelling securely" means "a confidence on their own ability to defend themselves militarily." No, when you really look at the Hebrew words and their biblical uses in the past with precedent, you find that it's really a security that is accomplished militarily through defeating one's enemies. I think in Ezekiel 28 we find out how Israel's security happens. There around verses 24-26 it says that Israel will dwell securely when those who share common borders around Israel, that despise Israel having judgment executed upon them, then they shall dwell securely, yashab betach. Dr. Reagan: Thank you! You have given us a good summary of Psalm 83 that was discussed in your original book. In the second segment on the War of Psalm 83 with Bill Salus, he'll fend off the criticism that Psalm 83 is merely an imprecatory prayer. Bill Salus says "Second Peter 1:20 says that no prophecy is subjected to individual interpretation." To me he offers a lot of "individual interpretation". He hasn't offered enough proof to me to be convinced that his viewpoint is proof positive and his interpretations and beliefs are more than opinion. See my comment at the bottom of the 27 June article above. Chapter and verse from the Lord's Word proving that the sum of Bill's exegesis on Psalm 83 are indeed correct.